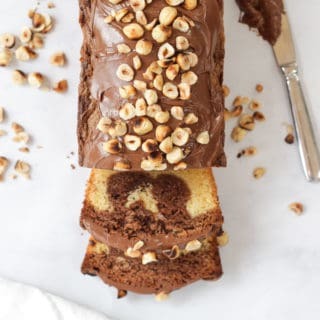 The easiest ever Nutella Cake – This Nutella sponge cake is an easy to make marble loaf cake, topped with Nutella as frosting and roasted hazelnuts. A really simple and delicious chocolate and nut cake. 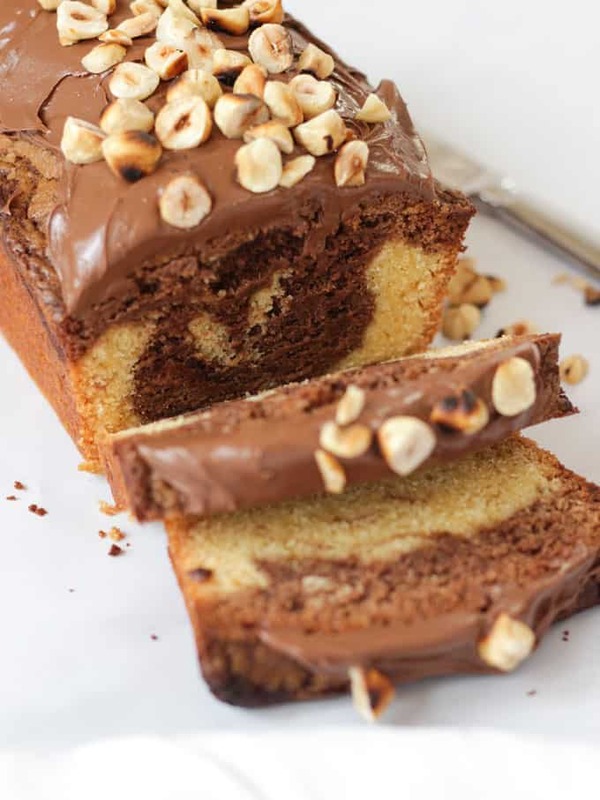 Oh Nutella Swirl Loaf, let me count the ways I love you. You crept upon me in a moment of urgent cake need, whisked up in just a moment or two. You’re so quick and simple, but I can take you anywhere, proud of your charm and rugged looks. Your nutty goodness makes anyone and everyone want to dive in and yet you still keep my secret..
That you’re really super easy to make. This Nutella Cake is a really simple cake batter, mixed up in just a few minutes with the usual creaming butter and sugar, then adding eggs and flour. You then take out a third of the batter, mix with Nutella. 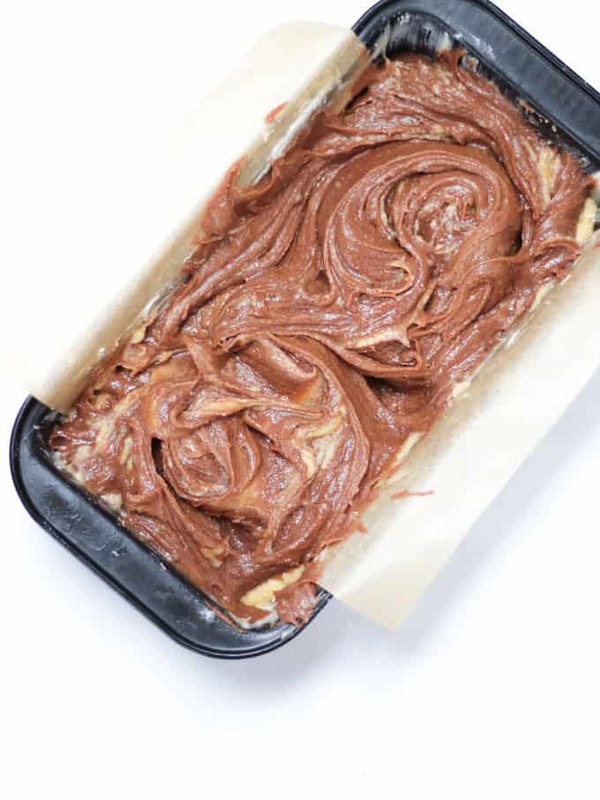 Pop it all into a greased and lined loaf tin, swirl a little and there you have it ready to bake. I then top it with more Nutella (is there ever enough?) and roasted hazelnuts. 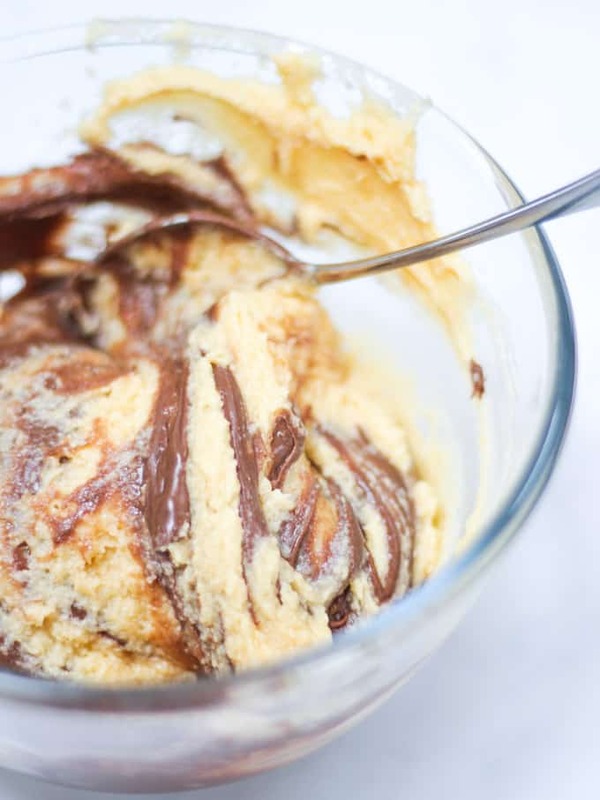 How do you make Nutella icing? To make Nutella frosting I generally use ratios of 25% Unsalted Butter, 25% Icing Sugar and 50% Nutella. Beat the butter and icing sugar until fluffy and then beat in the Nutella. Add a little boiling water to soften if necessary. However, in this recipe, I have cheated and used neat Nutella instead of icing as a shortcut to speed you up on your way to Nutella Cake heaven. Either option is fine. How do you melt Nutella? Nutella is simple to warm gently in the microwave (just 20 seconds or so). I like to warm it gently like this before mixing into the cake batter. It makes it far easier to combine with the cake batter. What can you do with Nutella? 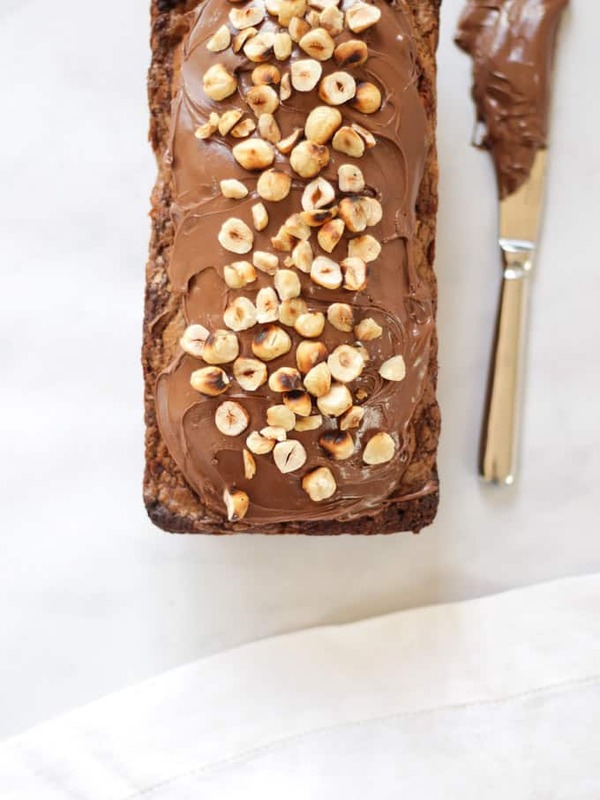 Nutella works so well in so many baking recipes, giving a delicious nutty chocolatey flavour. There’s heaps of inspiration on my Nutella Pinterest board or how about my No Bake Nutella Cheesecake or Peanut Butter Nutella Blondies? This recipe uses a 900g/2lb loaf tin like this one: Master Class Non-Stick Loaf Tin- 23cm x 13cm . Loaf tin sizes can be quite confusing as they are measured in weight and some recipe definitions of loaf tin size vs. weight vary. I find a 23cm x 13 cm loaf tin the right size for a family cake. Any bigger and it would become quite dry before the inside was cooked. This time may vary by up to 15 minutes either way depending on your oven so just check the cake at 45 minutes onwards. Be sure to line the tin with baking paper so that the cake comes out easily. Fancy some other chocolate cake recipes? How about my Chocolate Orange Cake recipe or my Ultimate Snickers Layer Cake? Hope you enjoy this recipe as much as we do. 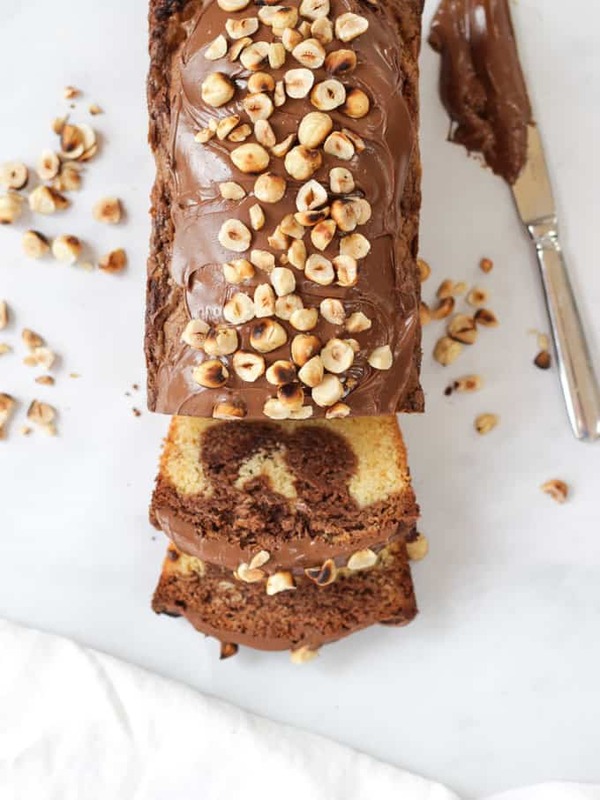 I’d love to know how you got on and what you thought of it if you make this Nutella Loaf recipe. Please rate the recipe and leave me a comment below if you do. 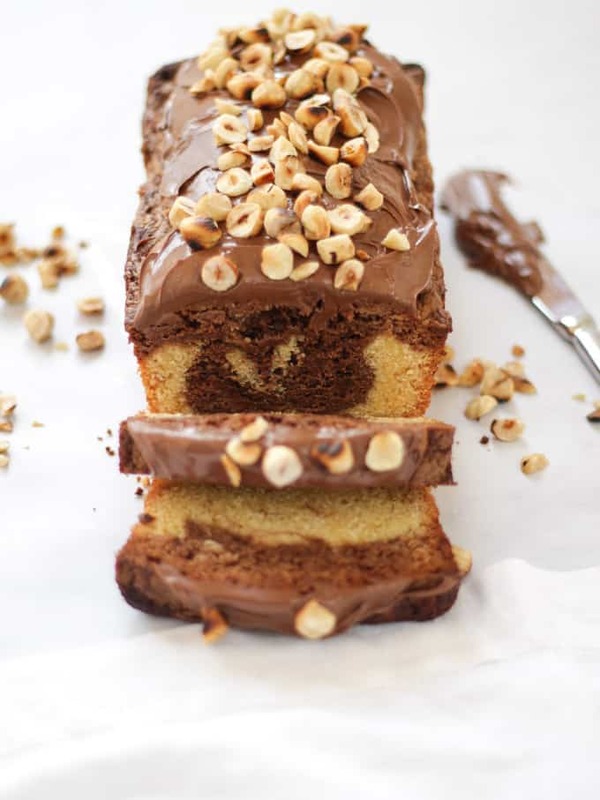 The easiest ever Nutella Cake - This Nutella sponge cake is an easy to make marble loaf cake, topped with Nutella as frosting and roasted hazelnuts. A really simple and delicious chocolate and nut cake. Pre-heat the oven to 160C (fan or 180C non fan). Beat in the eggs, don't worry if it curdles. Put the two thirds of the batter into a well greased and lined cake tin and add the Nutella flavoured batter. I put the batters side by side, lengthways down the tin. Swirl the batters together using a knife. Bake for about an hour or until a skewer comes out clean. This time may vary by up to 15 minutes either way depending on your oven so just check the cake at 45 minutes onwards. When the cake come out of the oven, leave the oven on and toast the hazelnuts in the oven until golden. If they are in their skins, toast until the skin is very dark brown and you can smell the nuts, then gently roll the nuts around in a tea towel until the skins fall off. Chop very roughly, leaving them still quite large. When the loaf is cold, turn out of the tin and slather on the remaining Nutella with a knife and top with the remaining toasted nuts. Oh my, its worth having a baby just to have that land on your doorstep! How do you convert 225g tp cups or teas.? You say this doesn’t look pretty but to me it looks like a sheer beauty. Very convenient seeing as I have a team meeting on Thursday and a lot of nutella in my house right now…. We can remain friends! It’s funny how nutella brings people together! OMG – This looks insanely delicious. Thanks for mentioning my pancake cake by the way. Whoa, do I need to have another baby before you’d make me one of these? Can’t I just give you my million dollar smile and wink? Wow what a gorgeous cake, I would have to have this for breakfast, lunch and tea! That has got my name written ALL over it. YUM, YUM, YUM!!! You clever thing!!!! Oh yum! Really can’t go wrong at all if Nutella is involved, I’d happily eat a slice of this for breakfast too. Oh goodness me, Nutella is my absolute weakness. This is a cake I’ve going to have to make. Love it. i always keep a jar of chocolate spread in the cupboard to make someting cakey with, cookies, brownies, cheesecake etc, it always helps me out!! Holy FLIP that looks amazing! Seriously, I need a slice NOW! Pinned and stumbled. This looks amazing and relatively simple. I’m definitely going to give it a try – my kids will love it! Oh my goodness, this is my idea of heaven! Thank you so much for sharing this. 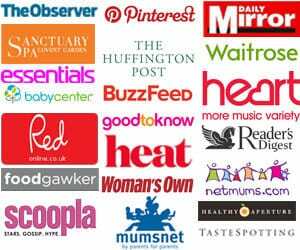 I also recently discovered you via YouTube – love your channel and blog. Thank you for this recipe, it’s delicious! Mine turned out a complete and utter disaster! I think 225g of butter is too much! It all just bubbled out of the tin on to the bottom of the oven!